"How much does a child's dentist visit cost?" "How much does a filling cost for my child's tooth?" "Will my insurance cover the cost of a pediatric dentist?" If pediatric dentistry were a product, you'd go online, search for the same product on multiple sites, find the lowest price, check for hidden costs like shipping and duty, and click buy. Unlike products, no two services are the same. In the case of pediatric dentistry, you're paying not only for important medical care, but also a positive experience that promotes a lifetime of good oral health. While dentists in British Columbia are free to set their own fees, many choose to follow the Suggested Fee Guide, published annually by the BC Dental Association. Like other specialties, pediatric dental fees are generally higher, reflecting the extra training, equipment, experience and time that's required to deliver specialized care. While your insurance plan may cover some or all of the difference, it's still an added cost. You need to consider what value you're getting in return. Depending on your child and the Dentist you choose, your cost can range from well below, to well above the Suggested Fee Guide. Likewise, your experience can range anywhere from an anxious child resistant to brushing and flossing, who kicks-and-screams all the way to the dentist, to a calm, confident child who consistently brushes, flosses and looks forward to their regular check-up. Which experience do you want for your family? Here are the four essential ingredients in providing that special experience your family deserves, at every visit. After college, general dentists must complete four years of dental school before they start practicing. Specialists complete 2-3 or more years of specialty residency in order to gain the knowledge and expertise needed to become experts at the special dental care needed by infants, children, adolescents and teenagers. Every dentist at Monarch Pediatric Dental has invested in the extra education necessary to earn their Certificate in Pediatric Dentistry from a qualified dental school. Except Dr. John, a pioneer in the field of pediatric dentistry, who began developing, advocating for and teaching pediatric oral health strategies and treatments after graduating dental school in 1977 - long before a certification existed. We believe that graduation from dental school is just the beginning of a lifelong education. We're constantly upgrading our knowledge of the latest innovations in pediatric dentistry so we can provide more modern treatment options using the most biocompatible materials possible. Pediatric dentists see kids from infancy to adulthood and not all equipment is one-size-fits-all. Most pediatric dental offices invest in additional equipment in order to provide specialized care to children of all shapes, sizes, comfort levels and abilities. Here's some of the special equipment we've invested in at Monarch Dental Centre. You want a dentist who knows how to make your kids feel comfortable and safe in our care. After all, a positive experience at the dentist contributes to healthy habits that lead to a lifetime of good oral health. They say it takes kids to truly understand kids... and at Monarch Dental Centre, we're kids at heart. We're experienced with kids of all ages from infancy to adulthood, of all comfort levels from, and all abilities and special needs. 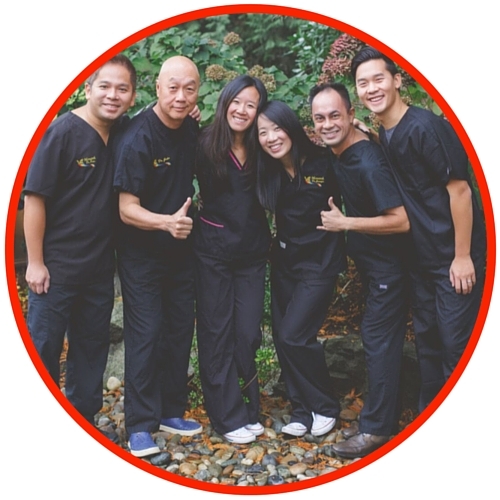 We've seen over 55,000 pediatric dental patients from across Greater Vancouver, Vancouver Island and British Columbia's interior region at our offices in Burnaby, Port Moody and Surrey, BC. Over hundreds of thousands of hours of practice relating to kids of all ages at their level, we developed Kid Friendly Care to make every Monarch patient feel safe and comfortable in our family's care no matter what treatment option we choose, and we always use simple, Kid Friendly Words. As a parent, you know that with kids, many things take a little extra time - and some things can take a lot. Have you ever had to ask your child to do something multiple times before they did it? Has your child ever curiously asked countless questions about something you're doing, or about to do? Have you ever had to encourage your child to focus on a task because they got distracted by something else? Of course you have, they're kids! In pediatric dentistry, dentists and Certified Dental Assistants discuss dental procedures and treatment options not only with one another, but with parents and patients (kids), too. Treatment options are can be greater and therefore often require additional explanation and consideration. With kids because we must consider not only cost, but also timing related to your child's growth and the risk associated with the loss of baby teeth. At Monarch, we believe children are special people and we take the extra time to explain the options to you and your child before moving forward with any treatment. The best dentist for your child is the one you feel most comfortable with. If you still don't find the answers you're looking for, call them up and ask questions, or visit their office. Ask what special training, equipment, experience and time each dentist has to provide you with the experience you want for your family. Chances are, a pediatric dentist is your best option to get specialized care your child deserves.